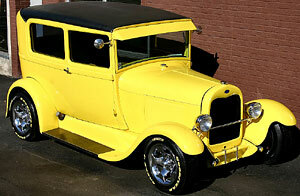 1928 FORD MODEL A, THIS KNOCK YOUR EYES OF OF YOUR HEAD, YELLOW STREET MACHINE HAS JUST BEEN FINISHED WITH LESS THAN 100 MILES ON THE FINISHED PRODUCT. THIS IS A REAL 1928 STEEL BODY CAR WITH FIBERGLASS FENDERS. THE STREET BEAST HAS A FRESHLY BUILD 300+HP 350CI ENGINE AND IS LAUNCHED BY A 350 TURBO TRANSMISSION. 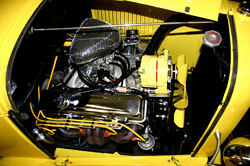 NO EXPENSE WAS SPARED TO BUILD THIS CAR ON A TCI FRAME WITH PETE & JAKES FRONT END AND SUSPENSION. 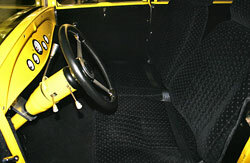 THE PAINT JOB IS OUTSTANDING AND THE NEW BLACK CLOTH INTERIOR IS VERY NICE AND NEW.